Modern Times Beer. DDH MT5! DIPA. 8.4% ABV. Double Dry Hopped with Nelson and Motueka hops. Originally brewed as the Modern Times 5th Anniversary DIPA last year. For this months on-line sale they re-released it as a DDH take on the OG. From the gorgeous milky yellow color to the huge Nelson driven nose this beer just rips out of the gate. Flavors are a potpourri of over ripe tropical goodness, sweet pineapples, mango, papaya, passion fruit and kiwi followed by sweet tangerine, nectarine and peach mid-palate. The body is pillowy soft from the oat additions yet finishes long, dry and bitter sweet. I am huge MT fan and have had my fair share of their NE styled IPA/DIPAs and IMHO this is the best they have done. It's at or above the top tier Monkish masterpieces. Can's are still available at some MT locations, seek this one out, you will not be disappointed. I ordered pours of each, and was very impressed. Then brought 4 packs of each home. As soon as the tender handed me the 4 pack of Stencil Crew I recognized the art, but I don't remember liking it this much. ... and that DDH MT5 --- On. Point. I loved MT5, but this is even better! Now that I think about it, I routinely prefer the DDH versions of beers I like. Have you found the same? And that question goes out to everybody ---- do you tend to prefer DDH versions to regular versions? There are a few examples where I find that Double dry hopping a beer takes it out of balance (Sixpoint’s Hi-Res is one), but I usually enjoy DDH versions more than the regular. One of the best breweries I have access to here in Pensacola (Parish) even does a quad dry hopped version of their flagship pale ale. Last edited by BRhoades on April 16th, 2019, 5:55 pm, edited 6 times in total. 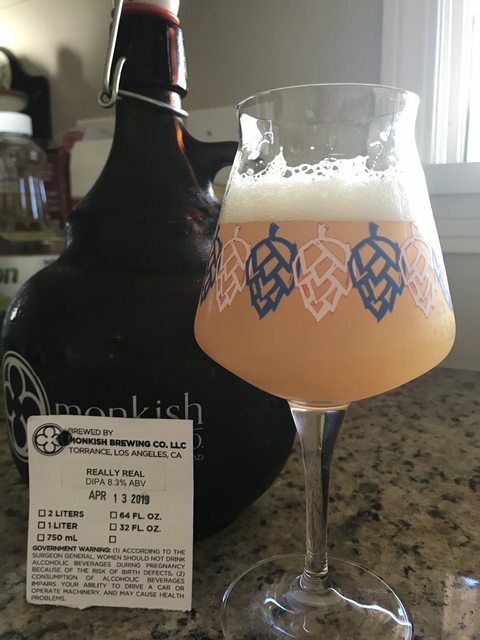 Monkish Brewing Co. Really Real. DIPA. 8.3% ABV. Hopped with Galaxy hops. This returns 6 months after it's last release and as a lover of single varietal hopped beers I always look forward to this one. Pours a nice hazy yellowish orange with an inch of tight packed bubbles. Galaxy has amazing aromatic qualities from ripe pineapple to sweet citrus fruits and they're evident on the nose. Flavors follow the nose with more of that juicy sweet pineapple before transitioning mid palate to more bitter sweet citrus fruits like red grapefruit and tangerine. Really Real has a more west coast mouth feel that's crisp and dry and finishes like a traditional west coast IPA, long dry and bitter sweet. Really Real is available at the brewery for tap pours and growler fills. If you love west coast IPAs with a bit of NE IPA DNA this is a beer you should try. Hmmm...that sounds really good, Bud! I think I had it previously, but don't recall what I thought of it. Bud/Brian/Andrew - here’s your chance to be more than just consumers of MT beer, but (tiny minority) owners of the company! I got an email from them earlier this week. As an investment it's laughable, this is aimed at the MT fan that for $252 per share can say they are part owners of one of the best breweries in the country, kind of like my " ownership " of my beloved Green Bay Packers ! Last edited by BRhoades on April 19th, 2019, 1:32 pm, edited 1 time in total. I got an email from them earlier this week. As an investment it's laughable, this is aimed at the MT fan that for $252 per share can say they are part owners of one if the best breweries in the country, kind of like my " ownership " of my beloved Green Bay Packers ! Exactly, the whole point of crowdfunding! I’m interested to see whether they raise up to the investment cap and, if so, how quickly. A hotly anticipated Seattle start-up Farmhouse brewery, Fair Isle (expected opening around August), relied on a combination of a traditional equity private placement to accredited investors and a crowdfunding revenue notes offering. They raised the money they sought, although I think the crowdfunding cap wasn’t hit until close to the closing date after being open for a few months. The cap is right around a million if I recall, this will be interesting to follow. Our cash in hand is $743,164, as of April 2019. Over the three months prior, revenues averaged $2,546,180/month, cost of goods sold has averaged $1,808,083/month, and operational expenses have averaged $738,083/month. I hate irrational competitors, and MT fits in that category. had one of El Segundo Brewing's - "Drop Shadow" NEIPA. Damn. This is legit-good, and I would expect nothing less from them. 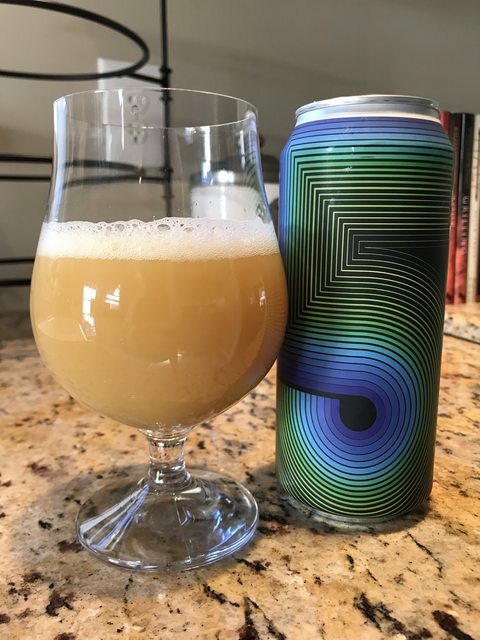 AFAIK, this is the first full-on hazy they've done, and they've knocked it out of the park. For the style, moderately priced at $15 for a 4-pack of pints. I will buy again. To be clear, I was/am not recommending anyone invest. Merely found it amusing/interesting. In fact, listen to the finance/brewer above, and stick to MT cans and pints if you enjoy their beer. Just had The Hollow Pilsner from Kent Falls Brewing (Kent, CT). Never heard of this brewery before - apparently they are a working farm brewery that grows their own hops. Definitely better than most of the Pilsners being rushed to market to jump on the Pilsner bandwagon, especially those made in WA, but still a notch below my favorites. And Rick, I drank this at Bottleworks, which only had maybe 4 bottles of your beer on the shelves (all Dunkel). Please send us more soon, specifically cans of Pils and Das Bier. It’s spring, which means it’s Lager (and Saison) season. I’ve still got plenty of Saison, but I’m all out of lagers. Unfortunately Patrick isn't planning on heading north until early May - we're canning Lenzbock and more Pils on 4/30, and he doesn't want to head up until we have more beer. I may have another, sooner alternative. If it comes about, I'll PM you. As of today after three days they are at 50% to cap, really people ? They are obviously extremely over extended and need free capital to finish both Anaheim and Santa Barbara sites. Love their beers but not the business models. Last edited by BRhoades on April 19th, 2019, 4:18 pm, edited 2 times in total. Excellent. If I have to wait until May, I’ll be forced to drive across Seattle to other places that may still have your beer in stock. Probably faster for me to just drive to your brewery with the shitshow that is Seattle traffic. Ive been hearing very good things about this one Brian, thanks for the post. People are always willing to make terrible investments (see Lyft IPO or Pets.com). At least the SEC’s crowdfunding rules cap how much individuals can invest to such small amounts that a complete loss should not be financially ruinous. No way will you be disappointed. Buy buy buy! Last edited by BRhoades on April 19th, 2019, 5:03 pm, edited 1 time in total. Said in his best Colin Cowherd voice ! Fort George Crysknife IPA - great beer. On the off chance you see this and like hazy/OJ IPAs, I’d jump on it. Deschutes Abyss - as always, fantastic on tap. Will be in Bend in a couple of weeks and we’ll be dropping in to grab this from the source. Chuckanut Single Hop Lager (Vic Secret) - Not sure if Chuckanut followed Heater Allen’s lead in creating a single Hop Pils with a non-traditional pils Hop (apparently their prior effort was with Citra), but this was a solid effort. Not better than their regular Pils or HA’s single Hop Pils. I do see these beers as the gateway drug for luring Hop heads to drink Pils. Hook them with a hoppy Pils (esp one with a Hop they know from IPAs), then once their palate is destroyed from years of Hop bombs, sours, and triple barrel aged candy stouts, you’ll have a captive customer. Oxbow Cohesion - dry hopped with Citra. A very good modern, hoppy Saison with a dry finish, but I kept thinking how I prefer my Saisons (1) to be led by the yeast profile (Blaugies, Dupont), not the hops, and (2) (mostly) with old school hops, not recent Hop (eg, Citra, Mosaic, etc), even when I love those hops in other beer styles. Thiriez Extra - like a cross of a dry, hoppy Saison and English bitter. Refreshing, spicy, hoppy, and low ABV. Could drink a lot of this on a warm day. I’m waiting for 3-Way, but if I see the Crysknife, I’ll give it a try. Have you tried Fremont’s Sky Kraken Hazy Pale? Not great, but one of the few Fremont beers I’d happily drink. Not an Abyss fan, but had a bottle a fellow Berserker left at my house (2016 aged in Scotch IIRC). My neighbor opened it the other night. One sip and I bowed out. He proceeded to drink entire bottle. And wobbled and stumbled his way across the street to his house. We had the owner of Moonlight Brewing stop by and hang out for a few hours yesterday. Moonlight makes some other stuff, but their big beers are Reality Czech Pilsner and Death and Taxes - a black lager. It's always good to compare ideas with someone trying to do the same thing that we are. Scotch-aged Abyss was a bit much, imho!